Doug Weiss - Double Bass. Recorded in Begues on May 24th 2016 by Adrián Mateo. 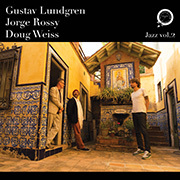 Mixed by Gustav Lundgren & Iñaki Marconi. 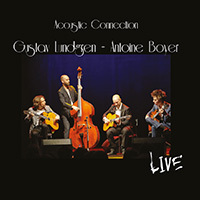 Recorded & Mixed by Niclas Höglind. Thanks to Musik i Blekinge!!! by Iñaki Marconi January 2017. Mixed & Mastered by Gustav Lundgren. Recorded in Bertheléville (France) by Iñaki Marconi on July 8-9 - 2014. 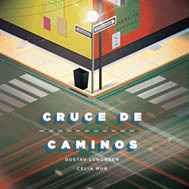 Music by Gustav Lundgren & Lyrics by Celia Fernandez de Moya except track 2 by Silvio Rodriguez, track 8 by Victor Young & Celia Fernandez de Moya and track 9 by Guillermo Breer. ℗ & © All rights reserved Lundgren Music 2014. 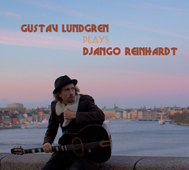 Recorded at the Farmer Street Studio Stockholm by Gustav Lundgren on January 13th & 14th 2014. Produced, Mixed & Mastered by Gustav Lundgren. Cover design by Hadrien Pennes. AJL guitars and AER amps. Release January 25 - 2014. 8 page booklet including all lyrics! Music by Gustav Lundgren & Lyrics by Lili Araujo Except track 1 & 6 (*) Music by Gustav Lundgren & Lili Araujo with Lyrics by Lili Araujo. 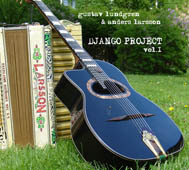 Gustav Lundgren - Violão de sete cordas, Steel-string Acoustic Guitar, Percussion & Cavaquinho. Lili Araujo - Vocals. Bernardo Aguiar - Percussion (1,2,4,6,8,9,10). Bebe Kramer - Accordion (1,5). Gabriel Grossi - Harmonica (1,8,11). Fredrik Carlquist - Clarinet, Flute & String Arrangement (2). ℗ & © All rights reserved Lundgren Music 2014. 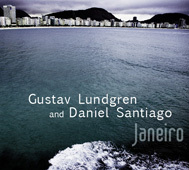 Recorded at Casa do mato Studios Rio de Janeiro Brazil on January 28-30 2013 by Eduardo Andrade & Ronaldo Lima. 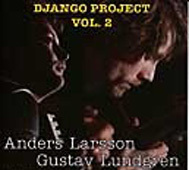 Overdubs recorded at the Farmer Street Studio Stockholm Sweden & Ubat Studio Sitges Spain by Gustav Lundgren & Fredrik Carlquist. 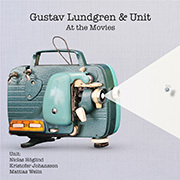 Mixed by Gustav Lundgren & Stefan Sundström. Mastered by Gustav Lundgren & Hampus Lundgren. Photos by Soraia Costa & David Wendfilm. Graphic Design by Gustav Lundgren. Release october 2013 ℗ & © All rights reserved Lundgren Music / FC Jazz 2013 Recorded at the Farmer Street Studio Stockholm, Ubat Studio Sitges, Calle de Brasil Algete & Stureparken Studio Stockholm by Gustav Lundgren, Fredrik Carlquist and Stefan Sundström 2012-2013. 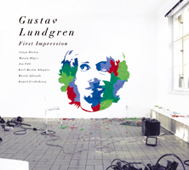 String & Flute arrangements by Fredrik Carlquist. Produced & Mixed by Gustav Lundgren & Fredrik Carlquist. Photos by Gustav Lundgren, Lili Araujo & Andreas Unge. Graphic Design by Gustav Lundgren. Release 2013-05-06. Recorded at the Farmer Street Studio in Stockholm by Gustav Lundgren on February 9, 23, 24, 2012 All tracks mixed by Patrik Boman, exept track 1 and 7 - mixed by Patrik Boman & Magnus Persson. Mastering by Claes Persson at CRP Recording. Photos by Hampus Lundgren & Gustav Lundgren. Art work & Production by Gustav Lundgren. 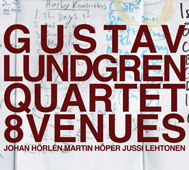 All arrangements by Gustav Lundgren except track 2 by Stefan Gustafson & track 3, 6 by Patrik Boman. 6 page digipak with 12 page booklet!!! 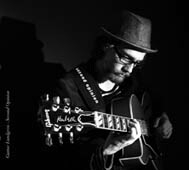 Barcelona - Estocolmo is a collaboration between Fredrik Carlquist and the Swedish guitar player Gustav Lundgren. Over the recent years, Gustav has made numerous apperences at Spanish clubs and festivals and, in the spring of 2011, the idea was born to record an album with a Swedish and a Spanish rhythm section. In the Stockholm session, we get to hear the Kenji Rabson on bass, an American living in Stockholm for many years, and the Swedish drummer Moussa Fadera- an extremely well-calibrated rhythm section that has established themselves as one of the absolute best in Sweden today. In the Barcelona session, we find the Scottish bassist Garry Fimister together with the Spanish drummer Xavi Hinojosa, two highly sought-after players on the Catalan jazz scene. 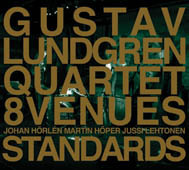 Göran Lind - Double Bass (10). Graphic design by Gustav Lundgren. Gustav Lundgren & Hampus Lundgren. Produced by Gustav Lundgren and Johan Nilsson. Art director Ted Harry Mellström. Graphic design Hanna Alm & Ted Harry Mellström. Photos by Mathilda Vinkka Haarla and Ted Harry Mellström. All tracks mixed and mastered by Johan Nilsson.